TAF / the art foundation happily presents the group exhibition A mirror to reflect myself upon curated by Angeliki Douveri, opening on Thursday November 1st 2018 at 20.30. The show will be running until the 18th of November. a world to die in». 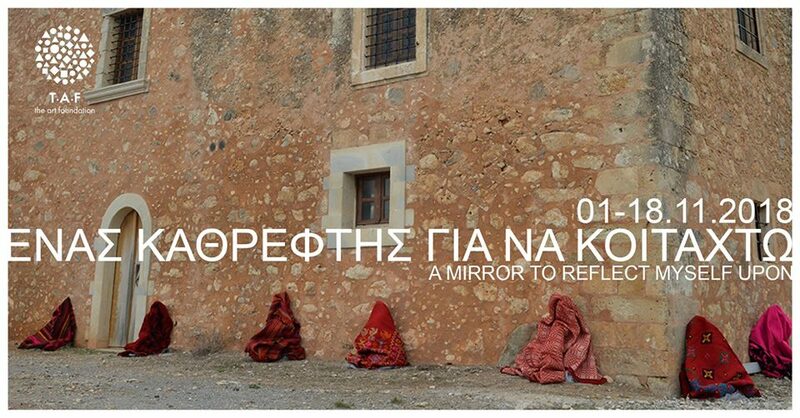 The title of the exhibition draws on the lines of Greek poet Tasos Leivaditis, referring to the new ways one can look at their familiar surroundings through the eyes and creativity of the Other. By bringing together works of 18 Greek and international artists, who had been residents of artAmari Residency over a period of five years, the exhibition focuses on how the participants conceived a large part of central Crete. Drawings, photographs, collage, embroidery, installations and performance were the result of the artists’ interaction with the local tradition, history, architecture and nature of Amari. On Sunday November 4 at 1pm, there will be an open discussion with artists Gonzalo Paramo, Ruth Weigand, Panagiotis Voulgaris and Stella Drygiannaki. On Sunday 18 November at 7pm, art historian Vassilki Vayenou will give a guided tour.